Anonymous, 06 Oct 2012So nice for you that you use other devices for photo, because it would have killed sony to put... moreyou are a little bit strange person. take so seriuosly what other use for their tablets or whatever. marry your Asus and be happy! Anonymous, 06 Oct 2012asus is too ugly. I like sonys out of dull looks other have. I dont need flash due using other... moreSo nice for you that you use other devices for photo, because it would have killed sony to put a LED flash on this one, right? Buy this then, and enjoy your weird niche product. Why dont you contact sony and tell them you use other devices for photos, so they can stop having LED flashes on all their phones also. asus is too ugly. I like sonys out of dull looks other have. I dont need flash due using other devices for photography and the screen resolution is very good for me at least. Also software is very smooth. Outside I use Galaxy note. Its coming soon, and will also be available with LTE. Full HD IPS for 2013, not Xperia S TFT LCD low res for 2011. 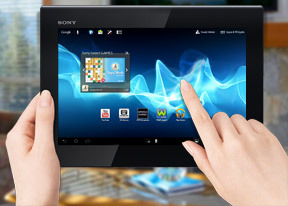 I like the start of the, that the first Sony tablets was not fit to survive. Same goes for this, time has run out, its another incomplete product from sony. Sony is my preferred brand, and my daughter is getting a tablet for xmas, before xmas actually, but its not gonna be sony, not this one, for sure. There are limits how many camels one have to swallow to get the preferred brand, im getting fed up with Sonys weird attempts that ends up in incomplete products. Would it have been so difficult to fix the list of disadvantages listed in the review?? NO, SONY HAD NO GOOD REASON, they just dont want to be competitive. Big No Thanx from me. I think we get the 3G Asus with full HD 1080p IPS display. It has only dual core but its Krait cores so its ok, and it has a modern resolution fit for 2013 and beyond. Bad brand yes, but better bad brand than bad product. Another gonna be failed attempt from Sony...keep trying and someone will take note of that! Something unique is writen all over it. Worthy of carrying Sony logo. I love my xperia tablet. I had the first generation tablet and now this. I was between galaxy note 10.1 and xperia, hw vs ideal design and chose design and dont regret it. I'll still buy galaxy note 2 so no problems there. It's an overall nice device, very well designed. And I like the fact Sony supported the faulty units ackowledging their responsibility for their products' issues unlike some other OEMs (Samsung and Apple among them). But this is definitely not the great hit Sony needed to get back on track and the price point is rather high for what they offer.